The US has called on the United Arab Emirates to review a court ruling which acquitted a member of its ruling family of torture charges. The court found Sheikh Issa bin Zayed al-Nahyan not guilty of abusing an Afghan man - apparently on grounds of diminished responsibility. A US state department official said questions had been raised and the US would welcome a careful review. US TV broadcast a video last year of the Afghan man being violently beaten. The tape showed Sheikh Issa apparently torturing the man, named as Mohamed Shapoor, in the desert at night, beating him, letting off rifle rounds close to him, and driving over him with a car. The sheikh, who is the half-brother of the UAE's president, Sheikh Khalifa bin Zayed, was acquitted on Sunday while five other defendants were found guilty. 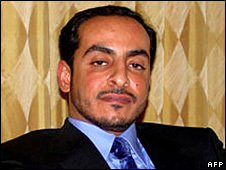 The case marks the first reported investigation of a UAE ruling family member. PJ Crowley, a spokesman for the US state department, said all members of Emirati society "must stand equal before the law". "We remain concerned for the victims of this horrible crime," he said. "We'd welcome a careful review of this decision... to ensure that the demands of justice are fully met in this case." The judge delivering the verdict in the trial did not explain the reasons for the acquittal. However, Sheikh Issa's defence said its plea of "diminished liability" had been accepted, Reuters news agency reports. The defence had argued that the sheikh had been drugged by two American-Lebanese brothers, Ghassan and Bassam Nabulsi, who recorded the beating in order to blackmail him. The Nabulsi brothers were sentenced in their absence to five years in prison for drugging Sheikh Hassan and attempting to blackmail him with the video. They were also fined 10,000 dirham ($2,723, £1,700). Three other men were sentenced to between one and three years for their role in the torture. The incident came to light after US television network ABC broadcast clips of the tape, which was smuggled out of the UAE by a former business associate of Sheikh Issa. Reports say the merchant had lost a consignment of grain belonging to Sheikh Issa worth $5,000 (£3,300). He survived the abuse, but needed extensive hospital treatment. The UAE is a federation of seven emirates and large expatriate populations. Each emirate is run by a ruling family and citizens are granted few political rights.